Hawaii is one of the many US states that has been blessed with more than its fair share of natural beauty. From an expansive coastline to colorful flora and breath-taking landscape, it’s no wonder that this tropical paradise is a popular destination for travelers. 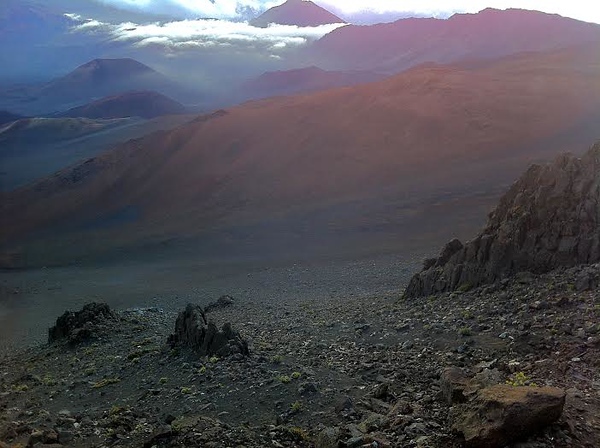 However, for those nature-loving travelers who like to get off the tourist path, seeking out some of Hawaii’s lesser known locations such as Haleakalā National Park is a must. Thankfully, today’s guest contibutor, Vanessa Chiasson is taking us on a trip to explore this gorgeous Hawaiian destination. 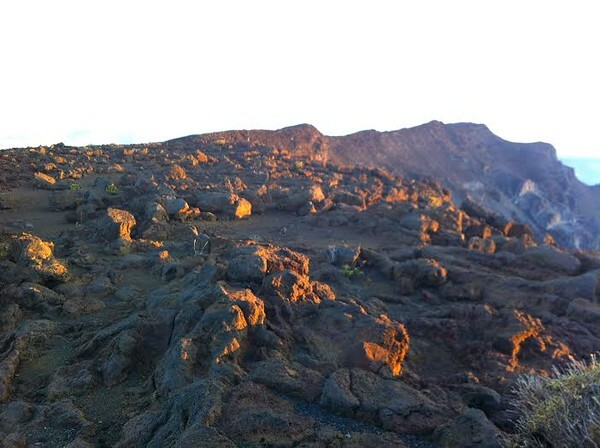 Viewing the spectacular Haleakala sunrise is a highlight of any Maui vacation. There are a multitude of outfitters offering different excursions to the summit but planning an independent trip is an easy and economical option. 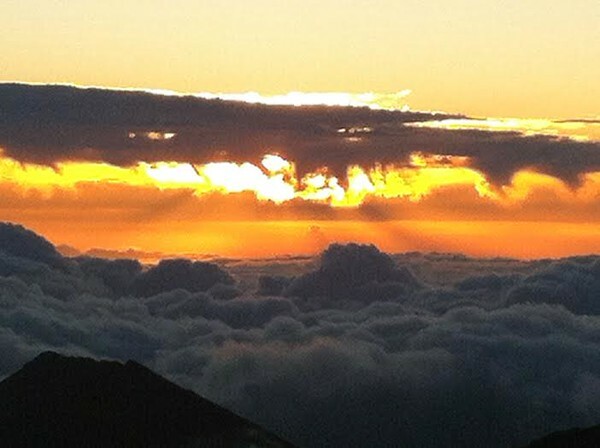 If you’re visiting Maui from North America, use the time change to your advantage and plan a trip to the summit on your first day. For better or for worse, jet lag will have you awake bright and early – best to make the most of it! The sunlight chases the early morning fog on the summit. We began our day at 3:00am with muffins and thermoses of hot chocolate in our Lahaina guest house before heading out in the dark and making our way to the park gates. Your drive will be a quiet one in these early hours but just before the park you’ll see a number of roadside stands offering hot coffee and basic breakfast fare. If you haven’t already stocked up, do so now. There’s no concession stands within the park and, trust me, you’re going to want something warm to wrap your hands around! Early morning light show on the Haleakala summit. The Haleakala summit is COLD in those early morning hours. The high altitude and the unhindered wind make for some mighty chilly moments. You’ll want to wear layers and plenty of them. Heck, bring along your beach towel and wear it as a cape! We found ourselves in a snug position against the fence and behind the visitors’ center – it blocked the wind a little bit and also blocked us from the jostling of the many other travelers all eager to share in the sunrise. Sunrise on Haleakala National Park. While your trip up to the summit was likely a dark one, prepare yourself for some spectacular views on the way back down. We frequently pulled over to admire the endangered silversword plants with their graceful and feathery leaves. 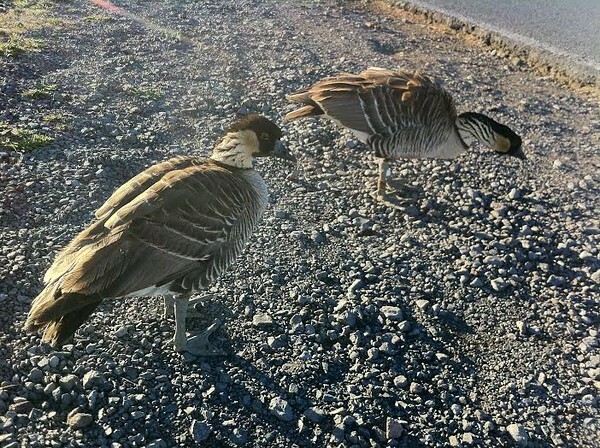 We also couldn’t help but be enamoured with the nene, the state bird of Hawaii. Nenes are greatly endangered birds that unfortunately don’t do much to help their own cause. These curious creatures all too frequently hang out on the side of the road and it’s every visitor’s responsibility to be on the lookout. You’re likely to see nenes and silverswords on Haleakala’s many hiking trails, which range from strenuous overnight trips to modest nature walks. My personal favorite is Hosmer’s Grove, a short loop near the visitor’s center. This area was once an experimental forestation project and trees from around the world were planted in hopes of creating a timber industry. This is the last place you’d expect to see Norwegian Spruce, but there it is! This is one of the quietest, most peaceful trails I’ve ever explored and it’s due in part to the work of The Friends of Haleakala Park. The Friends have worked tirelessly to remove many of the invasive alien species around Hosmer’s Grove and other areas of the park. They also lead multi-day service oriented hikes to help with this work and other aspects of park maintenance. The Friends aren’t the only group offering amazing travel opportunities for visitors. Like all National Parks, the rangers of Haleakala offer daily programs for both children and a general audience. You can even go on a guided hike with them! 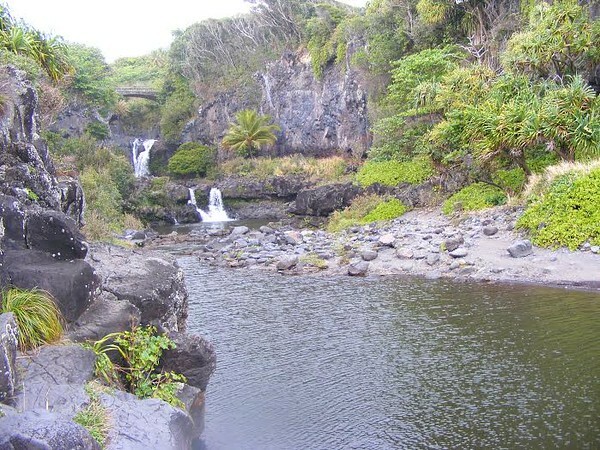 The rangers don’t just offer programing at the summit side of Haleakala but also at the second section of the park, the Kīpahulu District. 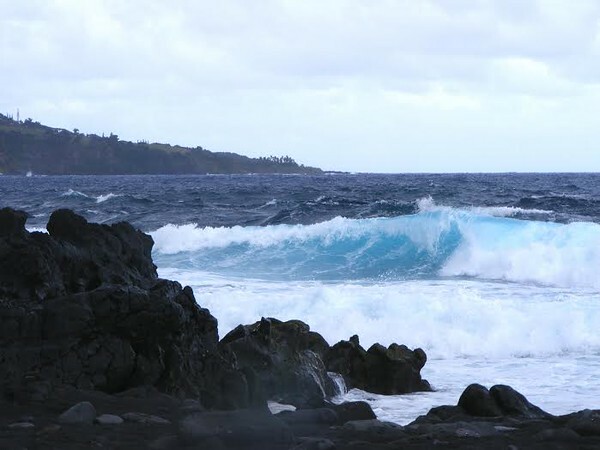 Accessible only through the remote south-west coast of the island, the Kipahula District entrance is just 12 miles from the town of Hana and a million miles from the look and feel of the Summit District. Here in Kipahula you’ll find the Maui that’s sold in the brochures. Everything is incredibly colourful and lush and bright – a huge contrast to the unearthly desert of the summit. Mini waterfalls of the ‘Ohe’o Gulch. 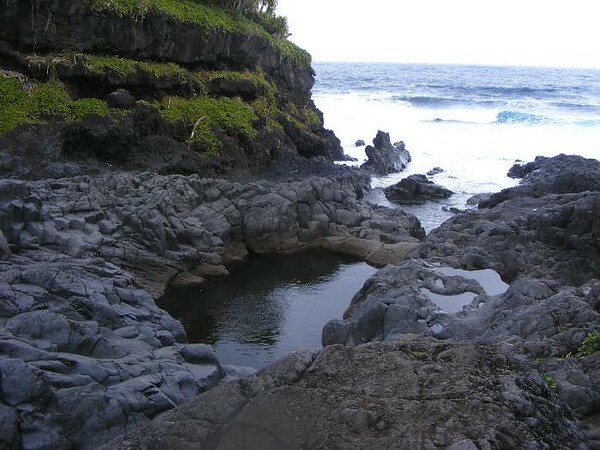 There’s wonderful hiking in the Kipahula District side of the park but the most popular attraction is the turquoise waters and mini waterfalls of the ‘Ohe’o Gulch. Haleakala doesn’t get much better than this! But, with all outdoor activities, take heed. This area is known for slippery rocks and flash floods and the possibility of being swept out to sea would almost certainly result in disaster – both rip tides and sharks like to hang out at the mouth of the pools. Yes, this area is gorgeous, but be careful! The ride to Haleakala may look short on a map, but don’t be deceived. A considerable portion of the drive involves a never-ending series of hairpin switchbacks that are unnerving to say the least. Before entering the park gates, we saw a number of roadside coffee and breakfast stands, which would allow travelers to stock up on hot drinks for the ride – Haleakala can be freezing cold in the morning! We had purchased an American National Parks Pass the previous summer, so we were happy to enjoy free admission. After watching the incredible sunrise, we enjoyed a leisurely drive back down the mountain, stopping at scenic lookouts and admiring the nene birds. We also did a short nature walk on one of the many trails – and in “touristy” Maui, we were the only people there, enjoying views of exotic trees from around the world. When we finally exited the park, it wasn’t even 9:00 am. We drove – with a few wrong turns – to Grandma’s Coffeehouse in southern Maui. We had a huge breakfast on the balcony, enjoying coffee harvested just feet away, and relaxed as a local guitar player entertained us and the coffeehouse cat slunk around, searching for dropped tidbits. Grabbing some banana nut bread for the road, we made our way to our next stop. Need help planning your next Hawaiian Adventure? Check out our Hawaii Travel Planning Guide in our Hawaii Travel Planning Guide page! The Surfing Goat Dairy is a really unique experience. In the heart of central Maui’s farmland, it’s a cheerful oasis of chevre production. We visited with adorable kids (baby goats, that is, not children) who were sweet and affectionate with us, and did their best to be aggressive with each other – producing hilarious results. We picked up cheese, of course, and goat’s milk soap before making our next stop – the beach! Beautiful coast along the Kipahula District. We weren’t really planning a beach stop just yet, but when we got to the coast, we couldn’t resist pulling over and walking out into the scorching sand and dipping our feet into the Pacific. It seems that with each stop we removed a layer of clothing and now finally we were down to bare legs! We could have stayed there forever, but at this point it wasn’t even noon and jet leg was starting to take its toll. Have you ever been to Haleakala or another national park in Hawaii? Join the conversation at the My Itchy Travel Feet page on Facebook or send us an email to ask a question or share your experience. Vanessa Chiasson shares inspired stories and tales of intrepid value travel at TurnipseedTravel.com. You can follow her adventures on Instagram at @Turnipseeds.